We at Signs.com are proud and excited to offer customers not only the best vinyl banners and yard signs on the market, but the most auditorily pleasing signage, as well. In addition to providing passersby with stunning visual imagery, our new singing signs offer exquisite acoustic bliss as well. Imagine—two of the five senses, coming together in one sign. Currently, the singing feature is available on two of our most popular products: yard signs and vinyl banners. The feature is an option that can be added at checkout for the low price of $34.95. An extensive library of 830 million popular songs in 75 languages. Don’t confuse our SingSpy unit with a simple motion-detector music box. No, this highly-developed, super-secret technology profiles passersby to offer the most customized sign experience on the market. This ensures that every single person who sees and hears your sign will feel as if your company or organization not only understands what his needs are, but connects right to the very core of his soul. Can your competitors do that? We didn’t think so. The person’s annual income, rounded to the nearest tenth of a penny. Names of all the person’s pets, from his first puppy at age 4 to his current parakeet. A list of all organizations for which the person is a member, including large national organizations such as AARP or AAA and smaller ones, such as The Simon Sablonski Star Trek Fan Club. The person’s top four greatest fears—from snakes to his mother-in-law. The person’s illegal and immoral activities, including the time he took his dad’s car for a joyride in 1962 and the afternoon of April 4, 2003 when he kept the 47 cents extra change the cashier at the Piggly Wiggly gave him by mistake. The person’s current emotional state. Whether he’s in the mood for a little Metallica or a light Neil Diamond tune, SingSpy will accurately detect his brain chemistry within three neurotransmitters or less. *Facial recognition data is automatically sent to the FBI, CIA and MI5. In addition to marketing your business, you are an integral part of a worldwide crime net designed to identify and capture dangerous felons, terrorists and Jason Bourne. Once the SingSpy profile is complete, the software will choose and play the absolute most appropriate song for the potential customer’s current state of being. For an even larger conversion rate, connect your Singing Sign to a Bose Surround Sound stereo system for a higher quality, higher volume customer experience. Our 830 million song database includes music from all genres, from Classic Rock to Post-Marxist-Venezuelan-Alphorn-Funk. A recent study at The Institute for Paid Marketing Studies showed that customers who are exposed to singing signs are more likely to buy, but their behavior depends on the type of song to which they are exposed. However, one song proved to be a gold mine. The song that created the most buyer confusion was Why? by Frankie Avalon. Researchers believe that this song was the impetus for catastrophic, existential crises amongst consumers. Those whose profile led to this song spent an average of $32,583, typically on sports cars, facial reconstruction surgery and Buddhist spa retreat packages. These four songs have been removed from the SingSpy music database. 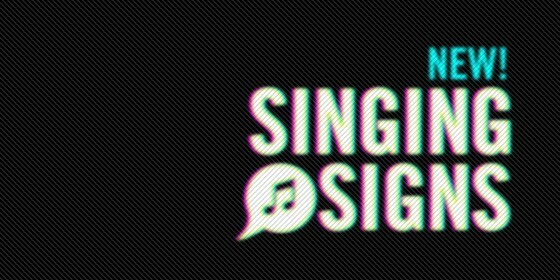 Get Your Singing Sign Now! Singing signs clearly offer exceptional value. They will increase your sales and emotionally influence your customers to do pretty much whatever you tell them. This technology is the first of its kind in the signage industry—get in on the ground floor of marketing nirvana. Signs.com will offer singing signs for a limited time only. Order yours today!